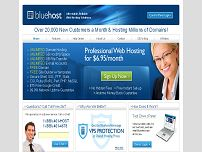 Bluehost has been providing quality web hosting solutions to businesses and individuals since 1996. Bluehost facilities include our 50,000 square foot headquarters with two secondary data centers locations totaling over 20,000 square feet of data center space. We provide UPS power, diesel generators, and multiple 10 gigabit fiber connections to locations all over the world. Bluehost.com provides world class hosting for only $6.95/month. We are currently one of the fastest growing hosting companies in the world. We offer features such as 1500 gigs of space, 15000 gigs of transfer, Perl, PHP, MySQL, SSH, FREE Site builder and more. Check us out now at http://www.bluehost.com. I've been a Bluehost Customer for 4 years and have been impressed with the reliability since day 1. I really like how I can host unlimited domains on a single account. My only complaint with them was on one occasion they changed my php.ini settings and didn't notify me so one of my apps stopped working, but when I let them know I was upset they agreed to provide advanced notice of any future changes they needed to make so I could prepare. Why I hate my iPhone 5! New Data Center Up And Running! Wordcamp Utah!! Come join us! A BIG speed and stability improvement! Entrepreneur or Leader or Both? Increase Website Speed & Cut Bandwidth Costs for FREE! Bad Apple or Great Kid?